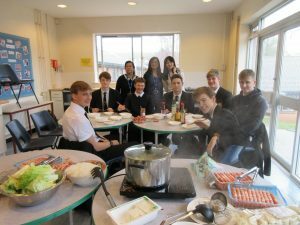 Mandarin Chinese has been taught at TBGS since 2006 and offers a wide range of levels focusing on both language and culture. China is a country which is changing rapidly and whose economy is growing steadily. With more and more Chinese nationals travelling overseas, and more and more businesses trading with China, Mandarin will prove to be an extremely useful tool now and in the future. Furthermore, the academic challenge of learning a new, non-Roman script language will stretch all students’ way of learning, way of thinking, and help them to think more deeply about the world around them, including their own culture. Learning languages opens so many doors into one’s own thinking and experiences, and also creates new opportunities for the future. We are very fortunate to have a Chinese language teacher come to join us from October to July each year. They are Chinese native speakers who fully qualified teachers in China, and will specialise in teaching Mandarin Chinese to non-native learners. They are sponsored by the Chinese government and take a full part in school life. We run a weekly study session for students of Chinese and Japanese. Each Friday there is a lunchtime session for anyone needing support with their studies. Look out for the Hanyu Helper reminder on the bulletin. 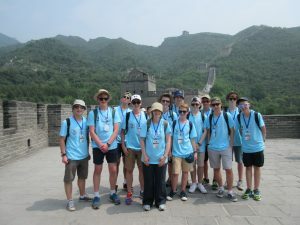 China Trip – a two week trip to China, open to students of Chinese in Years 10, 11 and 12. The trip takes place in July each year, visiting Beijing and one other city (decided by our hosts). Information letters are handed out in lessons in September each year. 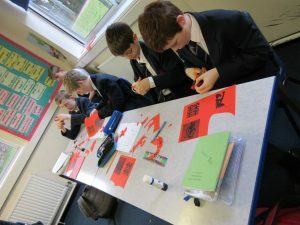 In Year 8 we provide an introduction to the Chinese language and culture. All four skills are taught simultaneously to encourage students to become familiar with the reading and writing of characters from the outset. Pinyin (romanisation) will be used to support learning. Past, present and future tenses. By the end of Year 8 an average student is expected to be able to read 60 characters and write between 30 and 50 individual characters (level 4). An exceptional student will be able to read up to 150 characters and write up to 100 characters (level 5+). In Year 9 students will build on their Year 8 work, continuing to use characters wherever possible and becoming less reliant on the use of pinyin. Students will be taught more complex grammar and be expected to use it wherever possible. Chinese festivals (Dragon Boat festival). By the end of Year 9 an average student is expected to be able to read 100 characters and write between 50 and 100 individual characters (level 5). An exceptional student will be able to read up to 250 characters and write up to 150 individual characters (level 6+). Group A will consist of the pre-GCSE group who will make a head-start on the grammar and topics required for AQA GCSE Chinese. Group B will consist of those who have elected not to continue Chinese in KS4. This group will use their existing knowledge of Chinese to complete the OCR ASSET qualification Breakthrough Chinese, levels 1-3. All pupils in this group complete level 1, most complete level 2, some complete level 3. The exam comprises of four parts: Listening; Speaking; Reading and Writing. There are translation elements in both the Reading and Writing papers. All papers are taken at the end of Year 11. We will also read a selection of Chinese poetry and short pieces of prose in Chinese. By the end of Year 10 students will be able to write 225-330 characters. By the end of Year 11 students will be able to write 350 – 400 characters from memory. In the Sixth form, there are two pathways open to students. If students have never studied Chinese before or have only studied it in Year 8 and 9, they may take the IB Mandarin Ab Initio course. This runs over five terms and aims to bring students’ language levels up to the equivalent of post-GCSE. As this is a beginners’ course, this option is not open to native or semi-native speakers or students who have studied Mandarin at GCSE. The above course is also available in a Japanese language option. If students have studied GCSE Mandarin, then they are able to study the IB Mandarin Standard Level course. This runs over five terms and expands the students’ knowledge of Chinese language and culture. Students who are native speakers of Chinese or Japanese are not permitted to take the above courses, and must instead take their native language as the Language A if they wish to study it as part of their IB course. There are very few careers which are not enhanced by the ability to speak a foreign language. Previous students have used their language ability in business, teaching, engineering, PR, and law to name a few. Many employers are impressed by the ability to learn a hard script language such as Mandarin, Japanese, Korean, Arabic or Russian as it provides an insight into the resilience and the determination of the student concerned. These traits can be useful tools in themselves, or can provide a springboard for organisations to send individuals on more specific language-learning courses to fully familiarise themselves with the technical language of the business concerned.